Guardianship is a major responsibility for the person assigned by a court to assume decision-making for a person. It is the conservator’s duty to use the protected person’s property exclusively for the protected person’s benefit. Here is a useful Handbook for Massachusetts Conservators. 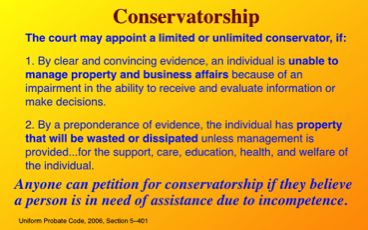 The court may limit a conservator’s duties to certain responsibilities, but it may also impose a “full” or plenary conservatorship, which is typical in the case of cognitive impairment. Responsibilities include preparing and filing with the court a detailed Inventory of the person’s estate which is submitted under oath. Here is a sample form filed in Barnstable Court: Conservator’s Inventory. The Inventory must be given to the protected person if s/he is 14 or older, and copy must go to any guardian or parent with whom the person resides. Additionally, the court may order that the conservator file a Financial Plan, which provides details about the protected person’s estate and their anticipated needs, plan for investment, etc. After reviewing the Plan the court issues an Order Regarding Conservator’s Financial Plan approving it, setting condition, not approving it, and/or setting a hearing on the matter. Next the conservator has to find and redirect any income, personal property, pensions, IRA’s, life insurance, credit cards, etc. and either cancel them, bring the accounts up to date, or maintain the accounts. If property is to be sold then the conservator must file a Petition for License to Sell before conveying any real estate owed by the protected person to another. Then the conservator must file an Annual Account with three schedules; A. reflecting all assets at the beginning of the year and any income during that year, B. reflecting all expenditures, and C. reflecting all remain assets at the end of the year. A conservatorship can be ended when: the protected person dies: no longer meets the standards used to establish it and the conservator files a Medical Certificate for Termination of the Conservatorship showing the person can receive and evaluate information and make decisions such that the conservatorship is no longer needed; or if the protected person moves out of state. Here are official details, as provided by the Massachusetts Court System: Massachusetts Law about Guardianship and Conservatorship. The National Guardianship Association, Inc. was formed to strengthen guardianship and its related services through quality assurance, networking and education and has information about issues on a national level.